to shade or gift pure expiration. flow. I am parchment left behind. I was recently introduced to The Gospel of Thomas among other writings that did not “make it” into the canonical gospels. Sharon Taylor, a spiritual director at the Church of the Holy Family, ECC, gave me a taste of these sayings of Jesus at a workshop. I am so very surprised to hear these words, many of which are used in the New Testament. These are transformative words. They open my eyes and heart to help me discover who I am. I also now realize how writing helps me process and understand, and then explain my learning. So my new project plan is to write a poem based on each of the sayings of my study of the Thomas gospel and the sharing within our study group. The above poem is a similar take, “twin” seems appropriate here, on one of my earlier poems in October, Marl. Must be the season. too long on holiday while we awaited his raindrops. at bay. Green George stayed away too long from us. But upon his return torrents announced his arrival. Maddened currents plowed barren fields in exultation. The deluge roared over and under our houses. Green Man never left and returned too late. tender greencoaties burrowed into slumber deep. powder resting upon his brow. 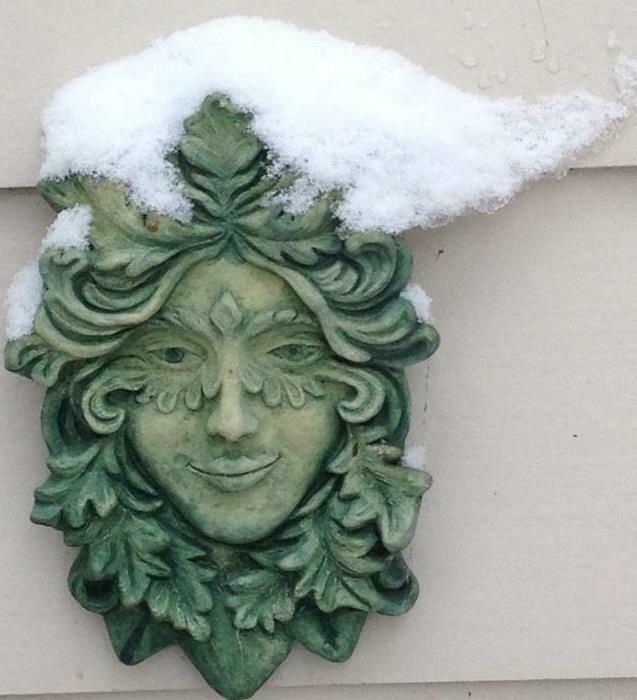 A friend of mine, Sharon Taylor, shared a lovely photo she took of her Green Man after our first snow. It was early this year, the snow. We usually count on snow for Halloween or a bit later. But weather patterns are different this year. Very little rain. Drought. Fires. And then came the September storms that washed much of Colorado away. I didn’t know that this is where the Green Man would take me. 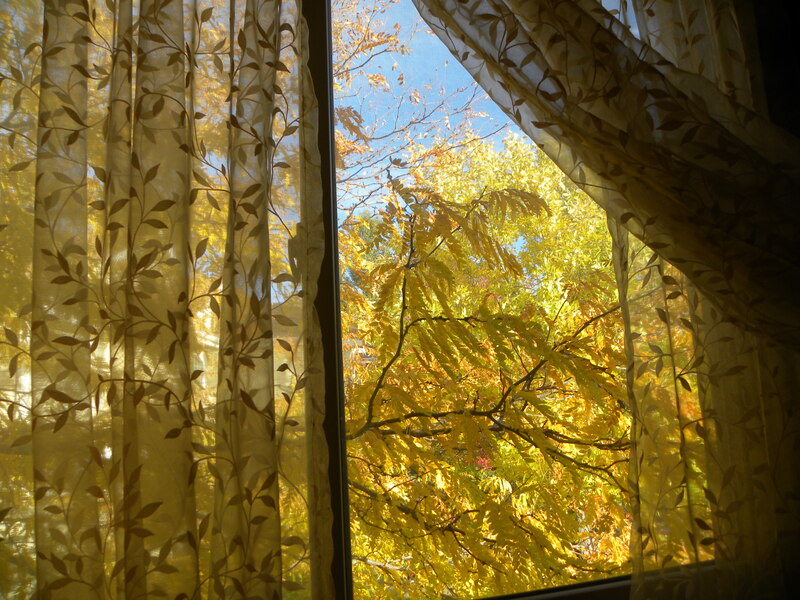 My window fills with golden light. ready to release their grasp. marl. Substance of the nucleus. In praise of the infinite. I cannot yet move on to the next theme from this Sunday’s homily at my sweet Church of the Holy Family, ECC. 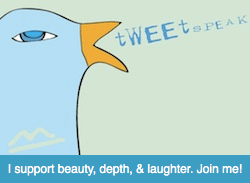 Sharon Taylor gave us a beautiful insight into quiet and the importance of meditation. However, I feel the need to continue a little while longer exploring the theme of gratitude. If I am grateful, it is not because I simply recognize the gifts I am given. I can only be truly grateful when I use those gifts, release my grip of my expectations, my needs and wants. My gratitude shines when I learn to love myself, the beautiful gift I’ve been given. My gratitude glows when I use those gifts and not hide them in fear of, well, in fear of all those things I fear. I cannot worry about what has happened or what will happen. I cannot be anxious about what people will think or say about me. I must live in the present, in the moment. Well, ta da! Here I arrive at Sharon’s suggestion of working quiet and meditation into our lives, something that grounds me into the present moment. It has been through my practice this past year of Passage Meditation with Kathleen Gorman and the amazing people who make up our small group satsang at my church, that I am coming to understand the importance of meditation in my life. Trust, release, love, and sharing awakens gratitude. Learning to be present in the moment of life is the inroad. Enjoy this moment, it is our gift. a sturdy handle, intelligent design. with abundance, urges use, legacy freely given. pronounce poison, the basket sits unwanted. basket there, fear no more to share. This is the theme for my lovely, little church this new season. As our new year begins, the Church of the Holy Family, ECC, embraces gratitude. I am grateful to have found this light. The fear of breaking away from the old held me much too long. I am grateful to my dear friend, Dorothea, for taking me under her wing and leading me through those doors. Even though she isn’t a member, my staunch Lutheran friend, somehow she knew it would be a perfect fit for me. I am grateful to have found voices that no longer claim to be compassionate, but loving voices that are genuine. I never really understood the word inclusive. Come with me some time and you will understand, too. I am grateful for the tiny storefront, gracious and beautiful with people who accept everyone for who they are. There are clergy who see inside you and know brokeness, because they have been broken. There is space open to the artist. It is not just art of song, poetry, and dance. There is art in the gifts each being brings without being asked. There is love, because there was no love in lives once upon a time. But now there is abundance. There is gratitude because gifts are shared without restraint. And not because something is needed. No. Gifts are shared because there are eyes who see gifts that have been hidden, forgotten, unused for many seasons. And even if the gifts do not seem to the giver as important or holy, the giver is assured that God our Father and Mother does not bequeath barren gifts to creation. Thank you, Fr. Scott, Reverend Kathleen, Deacons David and Mike, and all those who walk through the doors and give hugs with abandon. You are special and I am blessed to have you all in my life.